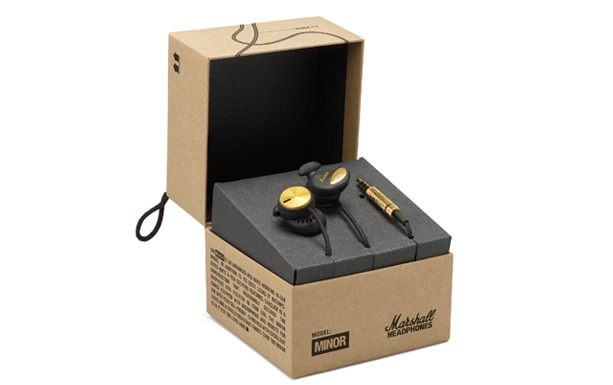 Marshall today released their new line of headphones called the Major and Minor. Some of you may know that Marshall is a well trusted amplifier maker so they know audio. The Major seen above bear the Marshall looks with a vinyl textured headband, coil cord that looks like a vintage style guitar cable with a 3.5mm replica of a classic tele plug. The Major have a 15.4mm moving dynamic coil speakers and have super soft ear cushions for all day listening. You can take the Major headphones with you where ever you go by folding them up due to their collapsable design. You can pick up the Major headphones right now for $99. If you prefer to go with in-ears, Marshall also have the Minor which are more portable and include a mic and remote to be used with mobile phones. The Minor feature a tangle resistant fabric cord with the same 3.5mm jack found on the Major. The Minor's EarClick ear tips securely fit in your ear without falling out. You can pick these up right now from Marshall's website for $59.